This page contains basic documentation for the BayLibre Another-Cute-Measurement-Equipment (ACME) software suite. Hence the ACME initiative was launched, with the objective of getting rid of all these limitations and providing the community with the most flexible low-cost but high-perf solution! 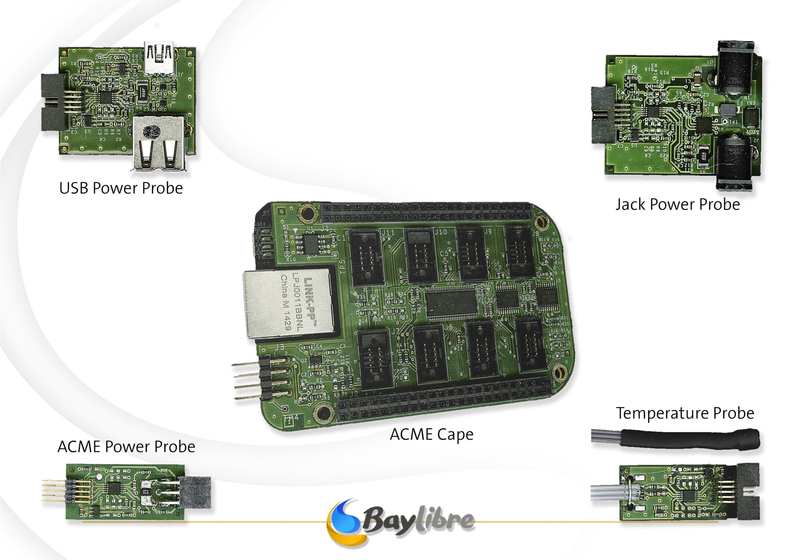 The proposed solution comes as an extension for the BeagleBone Black (the ACME Cape), designed to provide multi-channel power and temperature measurements capabilities to the BeagleBone Black (BBB). It comes with power and temperature probes integrating a power switch (the ACME Probes), turning it into an advanced all-in-one power/temperature measurement solution. The ACME initiative also proposes a new standard (free of charge) for power measurement connector (the ACME Power Connector), to solution the issue of development boards not being ready for power measurements. The ACME initiative is completely open source, from HW to SW drivers and applications. ACME Cape and Probes HW schematics may be downloaded from this link. Simply download an image according to your application, untar and flash (using dd) onto an SDCard. The first time, log into the BeagleBone-Black using minicom (115200 bauds) to setup your credentials and hostname if needed. Download link for a standalone device with an Oscilloscope-like GUI and also on-board sigrok command line tools. Download link for a remotely operated device for automation in a test infra using host-side client tools. The board will be reachable with AVAHI, by default its name is baylibre-acme.local, however, you may have to first log into it through minicom to set your credentials if not already done. Please refer to the README as it may be more up to date. Sigrok is a portable, cross-platform, Free/Libre/Open-Source signal analysis software suite that supports various device types (e.g. logic analyzers, oscilloscopes, power monitors, and many more). Sigrok is actively developed and maintained. We have chosen sigrok as the default front-end for ACME. For more information refer to sigrok.org. Sigrok packages have several external dependencies and are somewhat difficult to cross-compile. In order to make it easier for users to enjoy sigrok on their ACME enabled BeagleBone Black we have prepared sigrok packages for buildroot. They are now available in upstream thanks to BayLibre's contributions. the build will result in rootfs.tar file being present in output/images directory - this is the rootfs you're going to extract to your SD card or eMMC of the BBB. The above config file will make buildroot generate an image containing the command-line utility sigrok-cli and the graphical user interface pulseview (based on Qt5), which can be run through a minimal window manager - fluxbox - which is configured as well. Such buildroot-generated root file system is mostly ready to work, but in order to automate the initialization of ACME probes you can put the following script into /etc/init.d. This will initialize the probes, reload the drivers and start the X-server and fluxbox window manager for both the HDMI port and in a virtual console accessible via vncviewer. You can use this script as is or use it as an example. ACME uses mainline Linux version >= 4.0 plus a simple device tree patch available here. The kernel can be compiled by standard debian toolchain using this config file. After the build finishes copy zImage and am335x-boneblack.dtb onto the boot partition of the SD card and install modules on the rootfs partition by: ARCH=arm make modules_install INSTALL_MOD_PATH=<SD card mount point>. The defconfig for BeagleBone is am335x_evm. The BeagleBoard ROM bootloader first loads a file called “MLO” from the SD card. This requires special formatting of the SD card and copying of the “MLO” file to the SD card. The “MLO” file is provided by u-boot's Secondary Program Loader (SPL) functionality. It is placed into the u-boot folder upon build. The U-Boot SPL configures the off-chip memory and then loads the full u-boot. The file is typically called “u-boot.img” and SPL will typically look for it in the root folder of a FAT partition, but other options are possible. We are only presenting ACME-specific configuration options here. Sigrok expects ACME to be initialized i.e. probes enabled by setting proper GPIOs & ina2xx/tmp401 drivers loaded. Script available in Additional configuration section handles such initialization. 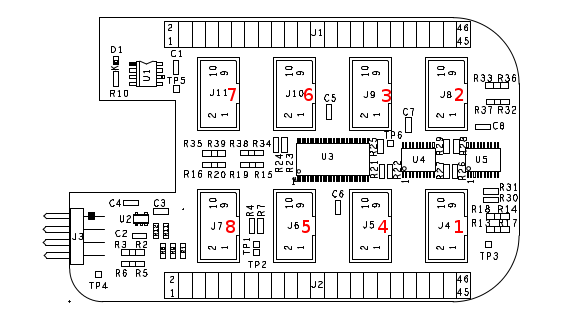 The following image represents which probe number is attributed to which ACME cape connector. The first three allow to affect data acquisition by specifying a samples limit, limiting the time of sampling or acquiring data until interrupted by user. Failed to set device option 'samplerate': invalid samplerate. Unfortunately there is no automatic detection mechanism available in revision 1. It is easily scriptable though using sigrok-cli. All the above options are advertised by libsigrok to all types of front-ends. PulseView for instance interprets them and displays proper widgets in the device configuration pop-up, so they're available in the GUI as well. The main limitation is that currently there is no way for libsigrok to send its data over the network, so both pulseview and sigrok-cli must be used locally on the BeagleBone Black. In case of sigrok-cli it isn't such a problem - it suffices to just use ssh/telnet/serial port to access the console, but in order to use pulseview you need either a monitor connected to the BeagleBone Black HDMI port or vncviewer and an X-server using a virtual frame buffer. And of course a minimal window manager. add vertical scaling of analog channels to pulseview (currently measurement changes for small values are not very well visible). The integration of the IIO driver into sigrok is Work In Progress. This is done in the form of a “generic-iio” driver that maps the IIO ontology for industrial devices/scan_elements into the Sigrok ontology for hardware monitoring channel-groups/channels. This integration of IIO also makes possible to remotely connect to the ACME using its IP address with the traditional “conn” driver option. in the example folder of libiio, you will find a small application called iio-monitor, that can come in handy to display real-time values install libcdk5-dev, and build it! Please send all bug reports and feature requests to acme@baylibre.com or directly to sigrok or buildroot mailing lists for sigrok and buildroot related problems with ACME. Legacy software for ACME is deprecated and no longer supported. If you really need some features, which are not yet available in sigrok, please refer to the legacy manual.